Given its proximity to the northeast, Canada has always provided (and still provides) a way for local musicians to perform outside of the country. 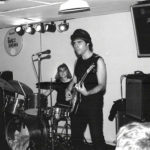 In the heyday of the garage revival, bands like The Gruesomes, Les Breastfeeders, and King Khan (among many others) continued the legacy that mid-60s bands like The Haunted and The Ugly Ducklings began. 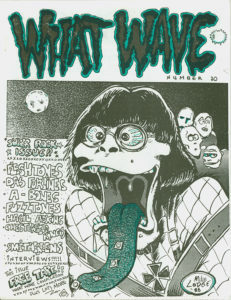 What Wave fanzine, based in London, Ontario, was one of the handful of fanzines that sprung up in the wake of the 80s revival up north. Besides offering the latest on live gigs and LP releases, What Wave was unique in that it also provided limited edition cassette tapes in issues. “What Wave zine was started by Al Cole in the late 70’s/early 80’s and he did the first 4 issues. He was burnt out, needed a change or something. He offered it to us in the fall of 1984. Issue of What Wave #10 1986. Courtesy of the What Wave Archives. I was reluctant as it sounded like a lot of work. My wife Rena, an English teacher, though was all for it. We had just come back from NYC and were just amazed at the bands we’d just seen; The Fuzztones, Pandoras, Tryfles, Slickee Boys, Fleshtones (we were HUGE Fleshtones fans and still are!) and so many more. I remember going to Venus Records and Midnight Records and just flipping out over the 60’s comps and 80’s garage combos. We felt like we were in a wasteland in colonial London Ontario Canada. So, with a bit of convincing from Tony and Gerard of the Montreal band Deja Voodoo, Rena and I took over What Wave. We started with issue #5 in the fall of 1984 and went right through to 1996 with issue #22. Starting with issue #10, almost all came with either a cassette or a 7″ record. It was our way of getting the music out to the fans. Once we started including cassettes, the zine started to sell quite well for awhile. Whenever we went down to NYC, we’d bring a full suitcase of WW zines and trade them at Midnight Records for records. The suitcase would always come home full of vinyl!! Records we couldn’t find in Canada as owner J.D. Martignon used to bring in all kinds of cool stuff. Once we had kids though, starting in April 1990, things really slowed down….just not enough energy, and time. Additionally, a lot of the bands were moving towards grunge and CD’s began taking over. The few issues that we were able to squeeze out between our daughter Erika’s birth and 1996 began having longer and longer breaks between them. While going through some old cassettes I actually found a few tracks from one of Dave’s compilation tapes, labelled “Live in London“. 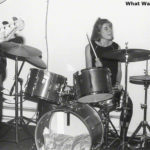 The song that caught my attention was a Headless Horsemen track with none other than future journalist Celia Farber on drums. 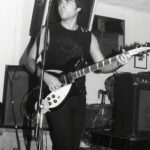 According to HH bassist Peter Stuart, this show was during the band’s first tour of Canada. Dave was kind enough to send a few images from his archives as well as a few additional thoughts. 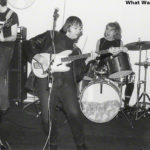 So, here is the Headless Horsemen from back in 1986 playing the Flamin’ Groovies classic, Shake Some Action. Many, many, thanks to the What Wave Archive and What Wave editor Dave O’Halloran and his wife Rena. Celia Farber, Elan Portnoy, July 25, 1986. Photo: Rena O’Halloran/What Wave Archives. Peter Stuart, Chris Cush, July 25, 1986. Photo: Rena O’Halloran/What Wave Archives. 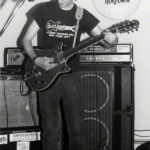 Elan Portnoy, July 25, 1986. Photo: Rena O’Halloran/What Wave Archives. Chris Cush, July 25, 1986. Photo: Rena O’Halloran/What Wave Archives. Chris Cush, Peter Stuart and Celia Farber, July 25, 1986. Photo: Rena O’Halloran/What Wave Archives. Celia Farber, July 25, 1986. Photo: Rena O’Halloran/What Wave Archives. This was an insane little road trip. Jesse Malin of Degeneration was our driver and was quite the troublemaker throughout. 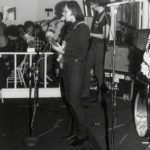 Link Protrudi and The Jay Men were fantastic, but Elan had just left the Fuzztones, which caused some awkward moments.